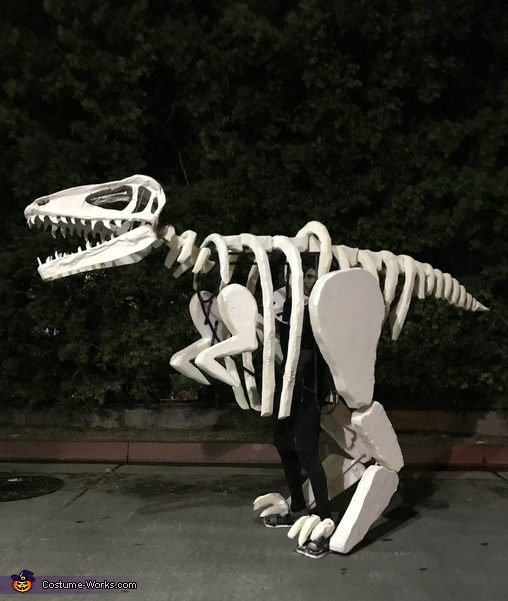 I made this dinosaur costume from 3/4” tube steel. It’s attached to an old backpacking frame so the weight could be distributed more evenly. All the tubes were hand bent and welded. The bones were carved from 4” PE foam which I bought in a 14’ sheet. I traced all the foam bits on the foam and cut each out with a long utility knife. To attach the bones I just used light gauge piano wire and white vinyl tape so the wire wouldn’t cut through the foam. The head and jaws are welded 3/16 steel wire with a gate hinge to allow the mouth to open & close. For the legs I decided to make the actual chicken leg design with the reverse knee so it was anatomically correct. For the mechanics on the neck I wanted it to move up down and left to right. I bent a circle piece of tube steel with a cross bar in between. To swivel an eye bolt for connection. I really wanted to make something mechanical this year. A suit of some type I could get inside an operate. This was my first attempt at anything like this, I’m really excited that it turned out so great. The idea came from night at the museum!